ITRADER is a CySEC licensed Forex & CFD broker owned by Hoch Capital Ltd.
iTrader is located at: Grosvernor Tower, Griva Digeni & Kolonakiou 125, Ground Floor, Linopetra 3107 Limassol. Contact phone numbers are: United Kingdom; +44 203 695 9401 and Cyprus; +357 77788511. Their contact email is: support@itrader.com, and the official website is: https://www.itrader.com/. For complaints or withdrawal problems, read this. 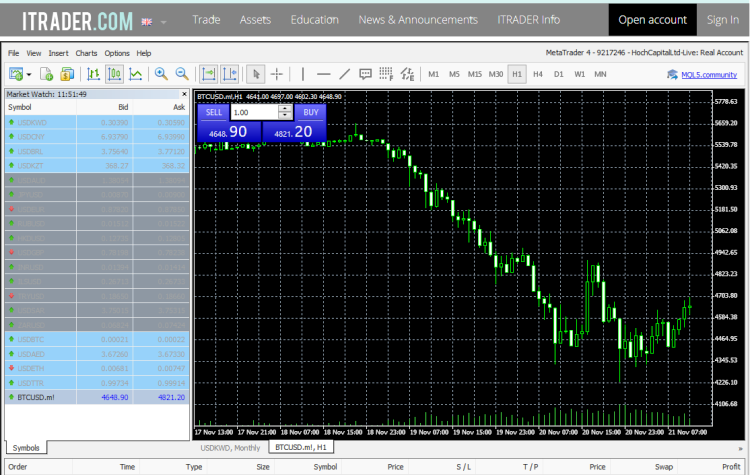 Our review of the Forex / CFD broker ITRADER shows that they offer investors the classic MetaTrader4 trading platform. There is available both the desktop standalone version, along with the web based and mobile versions. They offer in total more than 170 underlying assets for trading CFD’s including; Forex pairs, Crypto Currencies, Market Indexes, Individuals Shares, and Commodities like Brent, Crude Oil, Platinum, Coffee and Sugar. Depending on the type of client you are, maximum leverage is as high as 30:1, and spreads on the Euro Dollar pair are as high as 3 pips. Trading on leverage is very risky, and new traders should make sure they fully understand the risks associated with using margin. Their website and customer support is available in: English, Italian, Spanish, German and Russian. Minimum deposit requirement for a new trading account at ITRADER is $250. Account funding is possible via Credit Card, iDeal, Skrill, Trustly, PostePay, Entercash and Klarna. There are three levels of account types which offer various benefits. If your trading account was opened for you, via a trading software, Do Not Use that account, see why. First test drive a licensed software at: Duplitrade.eu. 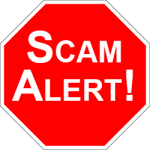 When the Scam Broker Investigator reviews a CFD Forex broker to see if they are a scam or legit, the first thing we look for is a valid brokers license. The main reason investors always use a licensed and regulated broker is to be sure that your funds are safe and kept in segregated accounts. ITRADER is licensed and regulated by CySEC in Cyprus, a member of the European Union, their licensed number is: 198/13. Outside of Europe, this broker is owned by Bayline Trading Limited, which is licensed in Belize, and located at 5 Cork Street, Belize City, Belize. Smart traders always verify that the broker they are going to invest with, is also licensed in their local country. Smart investors always review a few different brokers before making a final decision, See the best brokers list. ForTrade is a very popular broker in the United Kingdom that is licensed and authorized by the FCA. Investors really enjoy their customized trading platform, see here. Go register for a Free Demo Account at: ForTrade.com. 24Option is a European licensed broker offering a unique & easy trading platform, see here. Try a Free Demo Account, signup here. What was your experience trading with ITRADER? Please write your review in the comment section below.